Lost in a Memory – An Unorganized Mind/Musings and Memories with Photos *To view the complete Menu: Click on menu then use the down arrow to scroll down the Menu Categories. 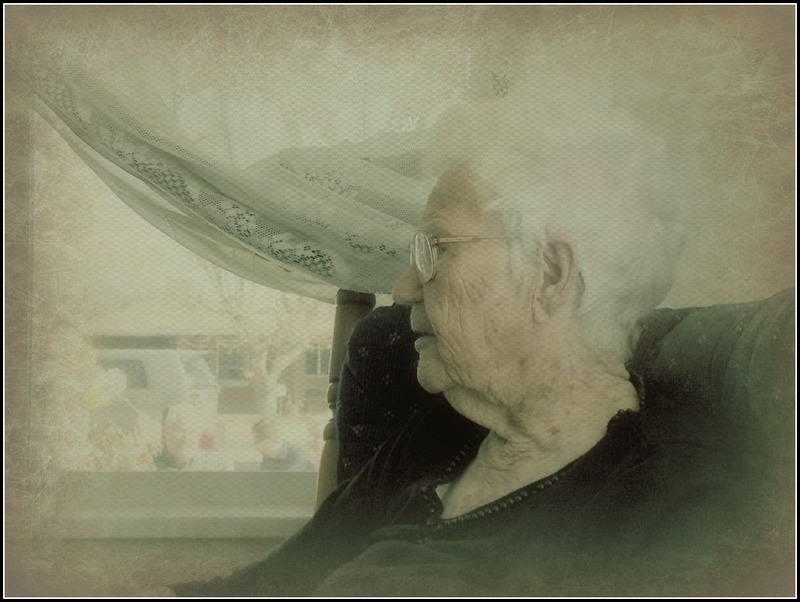 I captured this photo of Mom looking out the window at her party going on outdoors. This was a rare moment when she was alone (her favorite company) and able to watch the people from a distance, in a safe, comfortable way. This was on her 94th Birthday. She had just moved into the home she was born and raised in, her dream for many years. So many came to see her and it was such a special day. Of all days, though, I could barely get her out of bed before people started arriving! I couldn’t get her hair fixed, make-up on (which I did every day whether it was a big day or not) or even get her out of her nightgown at first. I was so dismayed. But it all worked out okay and, eventually, we got her into some clothes. She passed away six months later. That is a wonderful story and great photo Maggie. Glad she got to move into her home before she passed away. Thanks, Donna. Yes, I thought it was pretty amazing that someone, at 94 years old, could move back into the home of their birth and childhood. Most homes after that many years would be in a broken down state, if they even existed at all. I have gone back to a home I lived in with my first husband, stood in the EXACT spot where it was (back then in the outskirts of Las Vegas, mostly all desert and today a huge housing development on a busy intersection). Mom’s father built this little 2 bedroom adobe house where they raised 10 children! Many thanks. Most people did not realize how shy and awkward Mom felt in some social situations. She even did something that I didn’t know about until my daughter, who she had confided in, told me. She kept a peach pit in her mouth when she went out. I thought she did it because she developed a lip tremor that was embarrassing later in her life. I thought the peach pit helped control that. My daughter told me Mom did it to make her feel more comfortable in a group. Whatever works! Thanks for that story. What an interesting character your mom was. You should write more about her. She really was a very interesting woman and I have a dream to someday sit down and write something to do her justice. I better do it while I can recollect all the smallest details. I think in an outstanding life the strongest thread holding it all together was her plainess. She was classy in a very natural way yet as common as a mud fence. Non pretentious yet stood out in her endeavors and lived a good life. I have a slideshow of her life in another post. I’m on my phone now so can’t retrieve it while I’m on here, but would love to share it with you sometime. So I love old people especially the ones in my family, They give me sense of hope. Beautiful story by the way. I enjoyed it.